Innovative ornaments, frames, fan lamps, night lights, and other decorative holiday items for the home. Designs include candy canes, bells, angels, stars, stockings, trees, snowman, gingerbread men, Poinsettias, and more. 32 pages. Mosaics made with ceramic tile, stained glass, or any number of found objects are a stylish and popular way to add a decorative flair to your home. 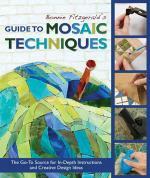 This detailed guide for beginners includes step-by-step photos that show exactly how to make your own mosaics using household items. Included are instructions for planning a design, cutting and affixing tiles, mixing and applying grout, and finishing your creation. It covers both the direct and indirect methods. 20 projects that include mosaic frames, decorative panels, tabletops, shelves, switch plates, pavers, bird houses, and more. 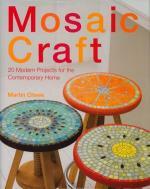 Make mosaics on any surface--mirrors, tables, chairs, picture frames, bowls, switch plate covers, wooden shoes, and more. 116 pages and hundreds of photos show project variations and possibilities. Practical information about cutting techniques, choosing an adhesive, and grouting. Advice on using color and designing your project to achieve the effect you want. Using your own unique found objects for one-of-a-kind gifts and home decor. 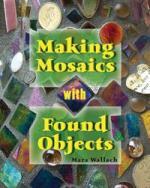 A great book for making beautiful mosaic candle votives and vases. Dress-up plain votives and vases using glass, beaded fringe and/or frit. Quick and easy designs from simple to advanced using both grout and gluing techniques. Color photos of projects included. A master of mosaics presents 20 gorgeous new projects for the contemporary home. This hardback book begins with information on the tools you need, and covers all the basic techniques with clear instructions and step-by-step photographs. The project section has 20 glorious designs that build in complexity as you progress in skill, from easy items that can be made in a few hours to more complex projects, taking a couple of days. 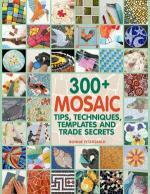 Discover the joys of creating tiled art with this complete guide to the art of mosaic crafting. 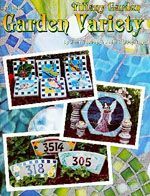 Patterns and instructions for 14 dazzling designs in mosaics Patterns include fish, fruit, floral, and more. 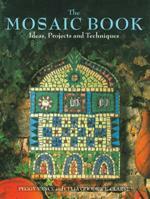 Also contains fresh ideas and instructions for adjusting your mosaic work to fit any size project. 36 pages in full color. 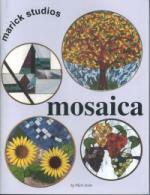 19 full-sized patterns for mosaic stepping stones and hanging panels. All projects are shown in color. The patterns include sunset, orchid, tree, medallion, iris, grapes, roses, and more. Great for beginners. 23 full-size patterns for most popular mosaic forms - 16" hex, 14" round, 8" round, 8" square, heart shape, 4"x8" brick and edge stones. Includes florals, cats, palm tree sunset, stars, shells, & more. Create mosaic house numbers, vegetable garden markers, fruit wreath, welcome stone, sea shell and flower stones, pet headstone, alpha/numeric sets for address markers. Included are 2 sets of alphabets and 2 sizes of numbers. New and creative techniques for creating stunning mosaics with a combination of fusing and mosaic work. Turn ordinary teapots, and plates into fabulous pieces of art. Also included are 14 projects for mirrors, pictures, teapots and statuary. All are easy to build, include detailed instructions and are shown in full color pictures. 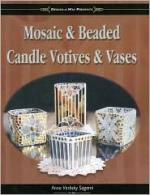 Contains 32 patterns for use as suncatchers, or for 8” round or square mosaic stones. Patterns include geometric abstracts, flowers, sailboat, hot air balloon, chili peppers, bald eagle, hearts, fish, and much more. In principle, mosaic is simple to create – it can be tackled by anyone who can tile a wall or glue down a collage. In practice, it needs to be carefully conceived, designed, planned and executed for a real professional look. 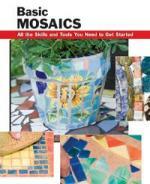 Practical and inspiring ideas for the beginner and the more experienced, this guide to the ancient art of mosaic features dazzling designs for home and garden, with 16 step–by–step projects, trace–off patterns, and an ample array of color photos to show you how to create your own beautiful mosaics. 15 patterns for the 48" diameter border form and coordinating patterns for the 8" sq. form. Repeat pattern to make a mosaic circle around a flower bed or birdbath. Use 8" square to extend border into oval shape. Contains six full size patterns for the 39"x17" garden bench, plus 9 complimentary designs for using a variety of stepping stone shapes. Complete detail instructions, leg options, and photos included. 5 full size birdbath designs can also be made as 14" round stepping stones. Plus five additional patterns for the 8"x16" border or wall plaque form. Includes 26 full size patterns using 7 different shaped forms to make everything from 16" hex stones to garden borders. There are designs for wall hangers, markers, garden benches, and stepping stones. Complete with step-by-step instructions. 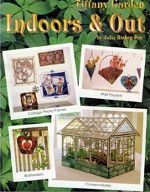 Contains patterns for a miniature stained glass greenhouse, stained glass picture frames, outdoor birdfeeders and wall pockets. Patterns include: Greenhouse Conservatory, Apple and Pear Birdfeeders, Lisa's Birdfeeders, Collage Photo Frames, Wall Pockets, Roundtop and Mini Conservatories, Mini Nugget Frame.